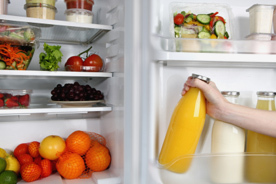 To me, the term “makeover” refers, not so much to a fabulous new haircut and an attractive make-up application, but rather to taking the clutter out of your fridge and pantry and giving them a whole new revitalized look! Let me come to your home and act as your kitchen’s personal stylist, going through your shelves and updating them. As we go through your fridge and pantry, I will reinforce what is positive about your food items while helping you to understand why there might be better choices for others. At the end of our session you will have the knowledge to look for the finest quality products the next time you go to the grocery store – and to keep your fridge and pantry always looking their best. And let’s face it, if your home is stocked with healthful foods for you to eat, you, in turn, will look and feel pretty amazing too! This service can be combined with the Supermarket Tour whereby we will first meet at your home to sort through your fridge and pantry, starting the Makeover process. Afterward, we will head to the supermarket – with a complete shopping list in hand – for a guided tour through the aisles. Once our shopping is completed, we will finish our makeover by restocking and organizing the shelves of your fridge and pantry with all your healthful new food.